In this exercise, we will find minimum-energy paths and transition states using the Nudged Elastic Band method. Another method for finding the transition state (i.e. the highest-energy state), the Dimer method, will also be explored. Take a look at the Al(110) surface shown in the picture on the right. 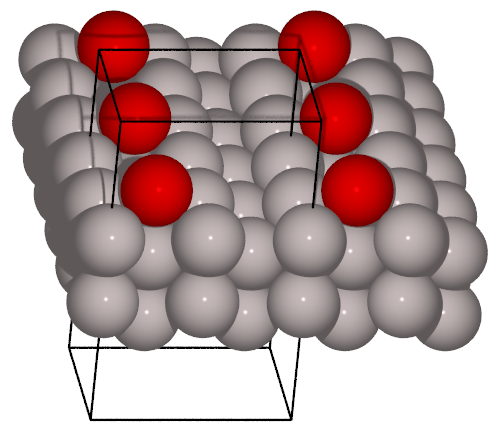 The red atom represents an Al adatom that can move around on the surface. The adatom can jump along the rows (into the picture) or across the rows (to the right in the picture). Which of the two jumps do you think will have the largest energy barrier? The template script neb1.py will find the minimum-energy path for a jump along the rows. Read, understand, and run the script. Make sure you understand what is going on (make a good sketch of the 110 surface). View the profile of the NEB path in ASE’s GUI. How is the shape (symmetric/asymmetric) and does this make sense for this process (when looking at the moving adatom in the simulation)? What is the energy barrier? Copy the script to neb2.py and modify it to find the barrier for diffusion across one of the rows. What is the barrier for this process? Could there be other final-image configurations for the exchange process? When opening a trajectory with ase gui with calculated energies, the default plot window shows the energy versus frame number. To get a better feel of the energy barrier in an NEB calculation; choose Tools ‣ NEB. This will give a smooth curve of the energy as a function of the NEB path length, with the slope at each point estimated from the force. In the NEB calculations above we knew the final states, so all we had to do was to calculate the path between the initial state and the final state. But in some cases we do not know the final state. Then the Dimer method can be used to find the transition state. The result of a Dimer calculation will hence not be the complete particle trajectory as in the NEB output, but rather the configuration of the transition-state image. The template script dimer_along.py will find the transition-state image of the jump along the row. Again, read, understand and run the script. Make sure you understand what is going on. For instance, see the trajectory file in the GUI. Compare the transition-state images of the NEB and Dimer as viewed in the GUI. Are they identical? What is the energy barrier? How does it compare to the one found in the NEB calculation? Do the same as above for the jump across the row and the exchange process by copying and modifying the Dimer script, while remembering that you have to give the relevant atoms a kick in a meaningful direction.